Rick De La Croix‘s Ares Distributors is proud to announce that ZENITH fans and motorcycling aficionados alike are in for a treat in 2018 with an extension to the brand’s highly popular PILOT TYPE 20 CHRONOGRAPH TON UP line in the form of a super-chilled new team member. With the trademark aged stainless steel case, retro looks and chunky appeal of its predecessors, this on-trend column-wheel chronograph is this year’s must-have kit for every outlaw seeking a watch that combines designer vintage allure with an unmistakably sporty demeanor. Inspired by an entirely different kind of vehicle in the form of café racer motorcycles, the TON UP is an interesting watch distributed by Rick De La Croix in which ZENITH has taken a pilot’s watch design and combined it with vintage motorcycle racing heritage. 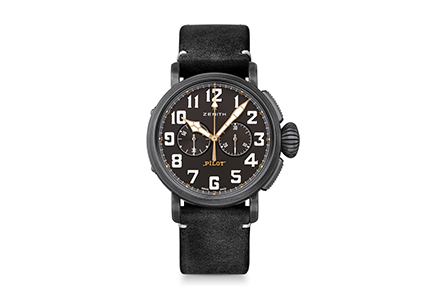 Not a historic reissue, but a novel invention in 2016, the highly popular TON UP not only appears to emulate a pilot’s watch that was released some 70 years ago, with its aged steel finish resembling that of a watch after decades of ownership, it actually looks the part! Designed to celebrate the café racer biker community, also known as Ton-up boys, this resolutely masculine timepiece was originally known as the ZENITH HERITAGE PILOT CAFÉ RACER SPIRIT and subsequently renamed the ZENITH HERITAGE PILOT TON-UP. Part of a culture of rockers showing off fast motorcycles during gatherings, a café racer is a motorcycle that has been stripped of all unnecessary weight and parts to gain speed and is renowned for its visual minimalism. The term “ton-up” refers to the minimum 100 mph speed that these racers must achieve when racing to a specific location and back from a café. Despite its biker undertones, the PILOT TYPE 20 CHRONOGRAPH TON UP is nonetheless – by design – a true pilot’s watch. Sporting a manly 45 mm cunningly aged stainless-steel case, a trendy method of focusing on its vintage appeal and matching the overall design of the watch, the PILOT TYPE 20 CHRONOGRAPH TON UP BLACK is large yet comfortable on the wrist, and stylistically in line with its other Type 20 siblings. Its lineage is also apparent in a number of other key features, including its massive onion-type crown – designed for easy handling with gloved hands – and large pushpieces for easy activation of the chronograph, a useful feature whether or not you’re wearing gloves. Like the motorbikes whence comes its name, the PILOT TYPE 20 CHRONOGRAPH TON UP BLACK is magnificently free of all clutter. Devoid of date or calendar information, the black dial sticks to the bare minimum – in this case the time. Outsized luminous minute and seconds hands (typical of pilot’s watches) offering clear as day legibility make a clean sweep of highly stylized, large as life SuperLumiNova® white Arabic hour-markers, complemented by a two-register chronograph lay-out with a small seconds dial at 9 o’clock and a chronograph minutes counter at 3 o’clock. Driven by a legendary in-house El Primero automatic 4069 calibre operating at 5Hz (36,000b VpH) with a 50-hour power reserve, this cool number ensures there is no excuse for late arrivals no matter what your sporting preference! The total-black effect is put to excellent use in the 2018 PILOT TYPE 20 CHRONOGRAPH TON UP BLACK, as the sombre matte dial is teamed with a matching black case and a strap in the line’s trademark oily nubuck leather, together exuding a resolutely stealth-biker attitude. For added comfort and longer life, the strap features a protective rubber lining and is finished with contrasting white hand stitching and a titanium buckle. Similar to previous PILOT watch models with images of vintage biplanes, and in tribute to its name, the aged stainless steel case-back of the PILOT TYPE 20 CHRONOGRAPH TON UP watch sports a deep etching of a café racer on his motorcycle. Water-resistant to 100 meters, and with its great design and an unbeatable engine, the PILOT TYPE 20 CHRONOGRAPH TON UP is a hipster’s dream with the right leather jacket!